While some people find it easy to visualize different images or ideas, others can struggle with this. Visualizing requires imagination, internal thought, and an ability to consider things in a different light or situation. 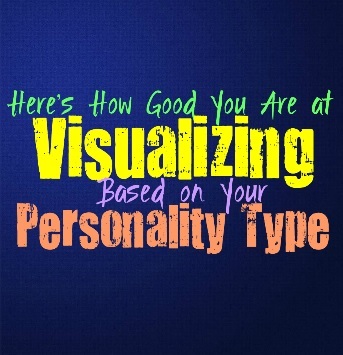 Here is how good you are at visualizing, based on your personality type. INFJs are often great at visualizing, since they do this naturally without much effort. Their minds constantly go to different thoughts and ideas, and can often imagine things in a different way just by thinking about it. INFJs have such rich and active inner minds, so the idea of visualizing really is not challenging for them. They can imagine things well into the future, considering all of the angles and feelings the way it would actually be for them in that moment. ENFJs are usually good at visualizing without having to put all that much effort into it. Their minds are such rich and active places, filled with different thoughts, images and ideas. When the ENFJ needs to visualize something happening they can often do this in a natural way without much trouble at all. They usually visualize things in order to help them achieve their goals and finish getting important things done in their daily lives. For the ENFJ visualizing is certainly not a challenge, and neither is their follow through with these thoughts and ideas. INFPs are definitely great visualizers, since they often do this naturally without actually putting forth the effort. Their minds can envision different thoughts, scenarios and ideas, sometimes without them compelling it to do so. INFPs minds are so active that they can sort of take them in different directions, causing the INFP to daydream and be distracted from the present moment. Visualizing is not a struggle for the INFP, and they can often imagine different scenarios inside of their minds. ENFPs have rather active imaginations, which helps them when it comes to visualizing different situations and ideas. Their minds often start to envision things without them propelling this, sometimes going off in different directions causing the ENFP to seem distracted. If they need to visualize something they can often do this in rather vivid detail, putting themselves easily into the situation. Where ENFPs might struggle is with situations they don’t want to visualize, and they might end up becoming distracted from this idea entirely. INTJs are often good at visualizing different situations in order to help them consider the path ahead. INTJs have vivid inner minds, in ways that most people don’t truly understand. INTJs can appear one way on the outside, seeming stern and focused, but inside their minds are very active, imaginative and rich. INTJs can often put themselves into future situations, visualizing how things would be and what the most effective path is for them to take. ENTJs do often visualize different situations much more than people realize. They can consider the future and visualize how things will likely go. Sometimes visualizing is what helps the ENTJ come up with the most efficient way to take on their problems and build a positive future. They are focused people who do whatever they can to get things done, but they also have very active inner minds and are highly capable of visualizing in a way that can help them advance. Visualizing is something that often comes naturally for the INTP, and is something they do without much effort. Their minds go into imagining different situations and potential scenarios, considering all of the possibilities. INTPs are good at putting themselves into future situations, but they often get caught up considering how this could go and where the different paths might lead. Instead of simply considering one idea or path, the INTPs mind will visualize many different outcomes and ways in which the situation might end up leading them. ENTPs are definitely capable of visualizing, since they often do this naturally. Instead of walking into a situation without thinking, the ENTP often does analyze as well as visualize. They will think about how things could go, imagining the many different possible outcomes. ENTPs minds consider so many things simultaneously, visualizing is just a part of what helps them analyze and think things through. ENTPs don’t struggle when it comes to putting themselves into different situations inside of their minds, so visualizing really isn’t difficult for them. ISTJs don’t always enjoy having to visualize scenarios, sometimes this feels a little pointless for them. They are more interested in looking at the facts that are directly in front of them, and strive to focus on how to understand this information better. Instead of visualizing and imaging how things might go, the ISTJ wants to learn and research the most logical outcome. They are focused on practical means, rather than imagining the potential and getting caught up in these ideas. ESFJs don’t usually like having to visualize too many different situations, and prefer to focus on facts. They are practical people who observe the information that has already been proven in order to move forward with the right choices. ESTJs are capable of visualizing before they move forward and get something done, since they do like to prepare themselves. For them it is more about planning things out and then practicing how they will go about it. ISFJs don’t often like to visualize, instead they would rather look at the facts before moving forward. They are practical people who simply want to take care of their loved ones and are often focused on the emotion well-being of others. In order to navigate a situation the ISFJ often reads the emotions of the room and tries to maintain the harmony with this natural ability. ISFJs are capable of visualizing when they are alone and have the ability to simply live inside of their own minds, but in most situations they prefer to focus on what is in front of them. ESFJs can sometimes visualize different situations in order to prepare them for what will happen next. For them it is often more useful to imagine their different lists and things they need to take care. ESFJs are interested in practical means of getting things done, since they want to be able to take care of their loved ones and provide for their needs. ESFJs can visualize some situations if they need to, but they don’t like getting so hung up on this that they don’t effectively get things done. ISTPs can visualize but they would much rather experience things themselves. Rather than sitting around imagining how a situation might go, the ISTP would rather dive in themselves. They often learn from experience, and live their lives in the present moment. Their ability to problem solve in done in a more factual manner, and comes naturally for them. These things don’t require visualization for the ISTP, and really isn’t that necessary. ESTPs can visualize but they prefer to actually experience things firsthand. They enjoy being able to live in the moment, and want to dive in instead of just imagine what might happen. ESTPs often learn from trying new things and don’t like having to just think about it inside of their minds. They aren’t interested in anything that holds them back from living, and in most situations ESTPs would rather dive in than simply visualize what they should do. ISFPs do have active imaginations and sometimes this means they enjoy visualizing different situations. While ISFPs can visualize, they prefer to take part in things firsthand. They don’t want to feel held back simply visualizing what will happen, they would rather experience it. ISFPs like to participate in life, and enjoy learning from their experiences rather than just their inner thoughts. ESFPs have vivid imaginations and sometimes this means they enjoy visualizing how things will be. Most of the time though, ESFPs prefer to actually participate rather than just think about inside of their minds. ESFPs are doers, and prefer taking part in things in order to truly experience them firsthand. They don’t need to just imagine things, instead they want to actually do them.